Our household moving company can handle any type of residential moving concern. Whether you’re moving from an apartment into a house, a condo into an apartment, or anything in between, our residential movers are standing by to provide you with fast, reliable, and professional service. At All Around Moving & Storage, we understand that any type of residential moving experience can be stressful. Because of this, we take the time to plan things out so you don’t have to deal with the details. Our residential moving experts will map out a complete schedule for your relocation, pack all of your belongings, load everything onto our state-of-the-art transport vehicles, and help you unload, unpack and organize at your new residence. As a professional residential moving company, All Around Moving & Storage also provides the best in moving supplies, including moving boxes, so that our customers are able to attain peace of mind. No matter what types of household items you need relocated, either across town or across the world, we have a solution. Our moving services team will consult with you to find the right moving cartons and moving storage solutions for your exact requirements, and all can be delivered and carried out according to your schedule. Are you seeking movers in Michigan who do it all? Welcome to All Around Moving & Storage. We’re tops among Ann Arbor moving companies. All Around Moving & Storage proudly serves the Ann Arbor area by offering premium moving services, including international, interstate and local moves. 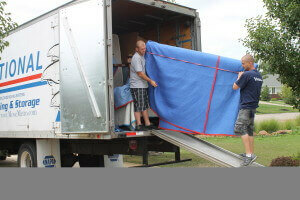 Our Michigan moving company provides honest and reliable service to help with every element of your relocation. Learn more about the Ann Arbor area. One of the unique things about our residential moving company is that we handle relocation requirements around the globe. While you can rely on All Around Moving & Storage for fast, reliable local movers, you can also count on our team for international moving solutions. No matter where you’re moving your home, All Around Moving & Storage will be here to help with knowledgeable experts and professional moving supplies. Using the latest in logistics software, we carefully monitor all relocation services so that we can give accurate, up-to-the-minute information regarding the location of our customers’ items. If a delay is expected, we can easily reroute our drivers and transport vehicles in order to provide more efficient results. Our household moving company is waiting to provide you with affordable residential moving services. Contact All Around Moving & Storage today to speak with an expert by calling 734-941-2280.